First of all, welcome to all my new readers and followers. The Grow Your Blog party last weekend was an amazing success. I found some awesome new blogs to read and gained some new followers. I promise to respond to all the wonderful comments I've gotten. Unfortunately, I woke up with the flu on Monday and am just recovering now. 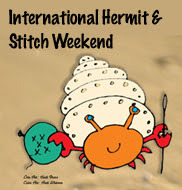 This past weekend was also the first International Hermit & Stitch Weekend of 2013 (and my first one ever). For those who don't know, IHSW occurs on the third weekend of every month. It gives us stitchers an excuse to hole up with our needlework for the whole weekend and just stitch away. If you want more information you can just click on the picture above and it will take you to Joysze's Random Ramblings for more information. I love working on my first HAED, but the small stitches are taking some getting used to. As of now I have finished 1,222 stitches out of the 7,840 on this page. As much fun as I'm having with it, I'm going to be putting it away this week to work on Nursery Rhyme Sampler. I get to pull it out again week after next though so I can't wait to show you more progress. Thank you! I've loving it so far. What a fun HAED! Your progress is lovely! Thanks for the comment. I love Spangler's Dragons and might try to tackle one of the full sized ones if this one works out. It was a good game. Cheering for the Leafs is hard sometimes. They've won 4 out of 7 games so far. Maybe they can win tomorrow.